With OS 10.3.1 rolled out for most users over the course of an entire month the majority of users have upgraded to the newest version of BlackBerry 10. 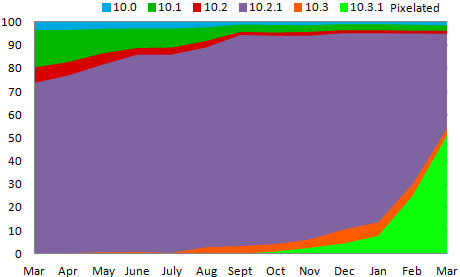 54.3% of Pixelated users, and 67.2% of Stuff I Need users were running a version of OS 10.3 in the month of March. While much better than BBOS, this is actually a bit slower than the roll out of OS 10.2.0 and 10.2.1 was a year ago. Holding BlackBerry back is the fact that a good number of carriers have still not rolled out the update. For developers, the need to maintain support for OS 10.2.1 isn’t yet gone. This data was collected by BlackBerry World for downloads of the free strategy game Pixelated and the free checklist app Stuff I Need. Data shown on the chart is from the beginning of March 2014 through the end of March 2015.